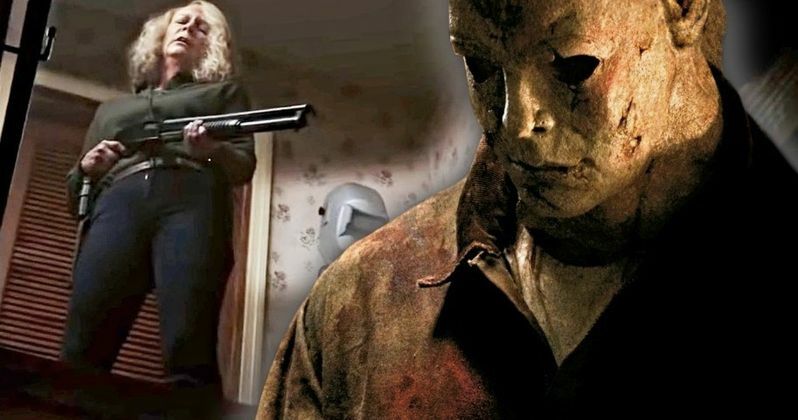 Just as Halloween fans were expecting, the final showdown between Laurie Strode and Michael Myers in David Gordon Green's new movie was rather bloody and brutal. The boogeyman managed to find his longtime nemesis at her home with her family, but this time, she was ready for him. With Michael attempting to break inside of the home and get his hands on her, Laurie shoots at his hand with a shotgun, blowing two of his fingers clean off. While it didn't ultimately slow Michael down too much, the wound the mass murderer sustained was pretty gruesome. That's even more apparent when seeing some behind-the-scenes photos from the set, with actor James Jude Courtney showing off his character's mutilated hand. In the pictures, Courtney presents the bloody hand with a smile on his face. As horrifying as he may have been in the movie while wearing the mask, it's clear he was having a lot of fun with the crew while on the set. The closer look at the effects show how detailed they are as well, as the injury looks eerily too realistic. Just so there's no question, it's clear from the pictures that one of Michael's hands is now missing two fingers, which may present some challenges for him when he returns in the planned sequel. Fortunately for him and not so much for everyone else in Haddonfield, Michael will still be able to firmly grip a kitchen knife in his other hand just fine. Courtney has every reason to grin, as his Halloween movie is nothing short of an immense success. It's now the highest-grossing slasher movie of all time, and not just the highest in the Halloween franchise. Plans are already in motion to follow up the movie with a sequel, and it seems likely Courtney will be brought back to play the role. Because Laurie Strode made it to the end of the movie alive, there remains unfinished business between her and Michael. Now that Laurie has survived two of Michael's massacres (in this timeline, anyway), The Shape is going to be more determined to finally kill his longtime foe. The movie did just as well critically as it did at the box office, for the most part. Fans and critics overall appreciated the new entry into the Halloween canon. Although it disregards every other sequel in the series, the movie is very faithful to the original in many ways. This includes bringing back Jamie Lee Curtis to reprise her iconic role and having John Carpenter executive produce and work on the movie's score. Fans are understandably leery whenever new filmmakers take the reins for continuing classic franchises, but given what we've seen, people will likely be even more excited to see another movie in the series back on the big screen. Halloween will be on sale digitally on Dec. 28 of this year, with the 4K/Blu-ray/DVD release hitting store shelves on Jan. 15. There's no word yet on when the inevitable sequel will begin production, but horror fans are all hoping it won't be long. These set photos come to us from James Jude Courtney's Instagram, and you can check them out below!